Salt, pepper and paprika the chicken pieces then brown in half the butter and place in a big casserole dish. Melt the rest of the butter in the same skillet you browned the chicken in, add the mushrooms and sauté for five minutes, stirring occasionally. Sprinkle flour over them and stir in the chicken broth and sherry. Cook for five minutes while you open the can of artichoke hearts, drain, and place the artichokes among the chicken pieces. Then pour the sherry-mushroom sauce over it all and bake for 45 minutes to one hour at 350 degrees. I was trying to remember where this recipe came from and then while looking through my ancient copy of The I Hate to Cook Book, there it was. (Bless Peg Bracken.) But my recipe is slightly different I realized as I compared it to the original – she says to cover the chicken as you bake it! Who knew? I didn’t copy the recipe properly! And I seem to have switched the proportions around. But hey, it worked the other night. It’s still delicious and is just one of those very forgiving recipes. 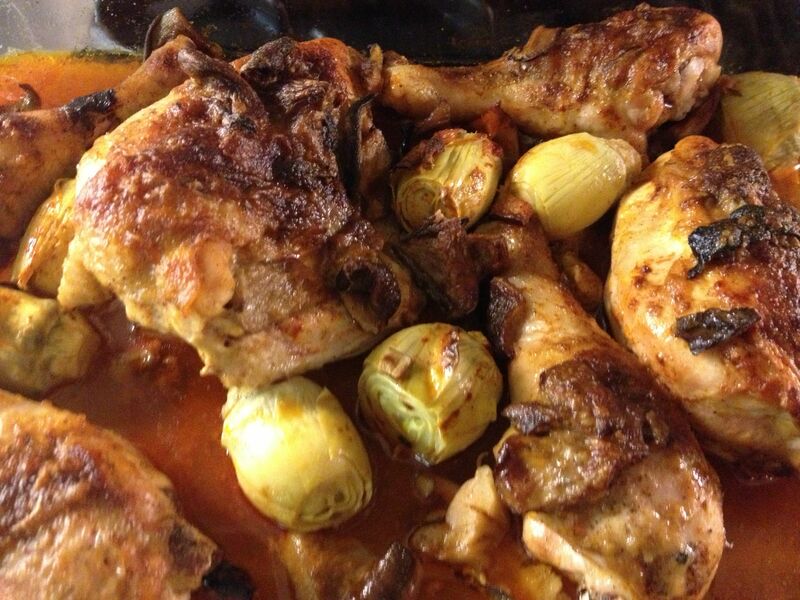 And speaking of forgiving recipes – the recipe I gave you for Beatrice’s Brazilian Stew had a missing ingredient. As forgiving as that recipe is, it still needs 14 oz. of chicken or vegetable broth. I feel awful about this and have been all over Facebook apologizing. A lot of people came to that post and I have this nightmare of all of you standing in your kitchens with big bowls of expensive fish marinating in the juice of all those limes you squeezed and then getting to the part about adding the broth and saying, “Huh?” Thanks to my friend Deborah for alerting me to this disaster. Mea culpa.